I joined U Drive MSM in November 2011, bringing my vast experience and knowledge not only as a Driving Instructor but also as a Caravan and B+E Instructor. 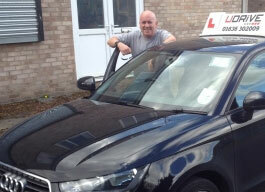 I also offer the Pass Plus course to newly qualified drivers to help aid their further learning and confidence. I also have experience in teaching young adults with Special Educational Needs which I find very rewarding.